Mindless Mirth: One Of The Most Massive Sunspots In Years, AR1520, Is Turning Toward Earth! 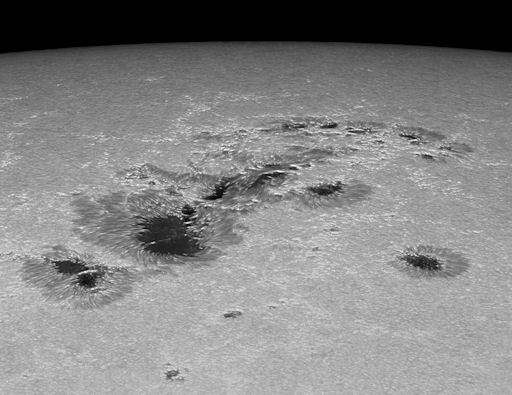 One Of The Most Massive Sunspots In Years, AR1520, Is Turning Toward Earth! AR1520 stretches more than 127,000 km (10 Earth diameters) from end to end, and the magnetic field of this enormous sunspot harbors energy for strong solar flares. NOAA forecasters estimate an 80% chance of M-flares and a 25% chance of X-flares during the next few days, according to Spaceweather.com. The magnetic field of this enormous sunspot is tangled, and harbors energy for strong solar flares. Look for possible Aurora activity, and who knows... maybe even a cataclysmic event in the wake of a monster flare! That's incredible! Especially reading about how big it is compared to Earth!